This thread is sort of the opposite of the "Did anyone SEE ME?" thread. If you are looking for someone you met, post here. It would be helpful if you provide as much information as possible, such as what day you saw this person and what they were wearing at the time. Please do not post new "I'm looking for..." threads. Reply to this post if you want to find someone. Any new threads started for this purpose will be deleted to avoid forum clutter. I'm looking for the Riddler that I met Saturday night. You went to the Cheesecake Factory and we had a brief interaction that *may* have been flirting, but I couldn't tell... Your costume was only half-on and you confused me for Alphonse or Elric I think, even though I was not ina costume (but in a Giga Pudding t-shirt). Im looking for Tomaki from Ouran, i took a picture with you and you had responded to me when you heard me screaming into my phone "OMG ITS MY BOYFRIEND"
I noticed you didn't have a Hiro and I really wanted to jump in but social anxiety flared up. I loved all of your cosplays and immediately regretted not asking for a photo. If any of you ever want photos with a Hiro or want to form a group in the future though, I'll muster up more courage next time. I'm not actually as horrible as my nervous face makes me look. Thanks for being super! P.S. Thank you again to the kind Baymax that gave me a heart-shaped lollipop on Sunday! You seriously made my day and reminded me of why I still come back to AB year after year. Shout out to this Mikasa! I didn't realize that we had pictures taken last year until I looked over this and thought you looked familiar! Hey! Just want to shout out to my Cosplay Games buddies! Shout out to Tohru and Homura in the Deathmatch, Kyoko in the Couples Game, and Maka, Sheik, and the Kill La Kill girl (I'm sorry, I don't watch Kill La Kill so I don't know your name!) in the Dating Game! I was Kiki in the Deathmatch and Dating Game and Sayaka in the Couples Game and it was super fun to do it with you guys! 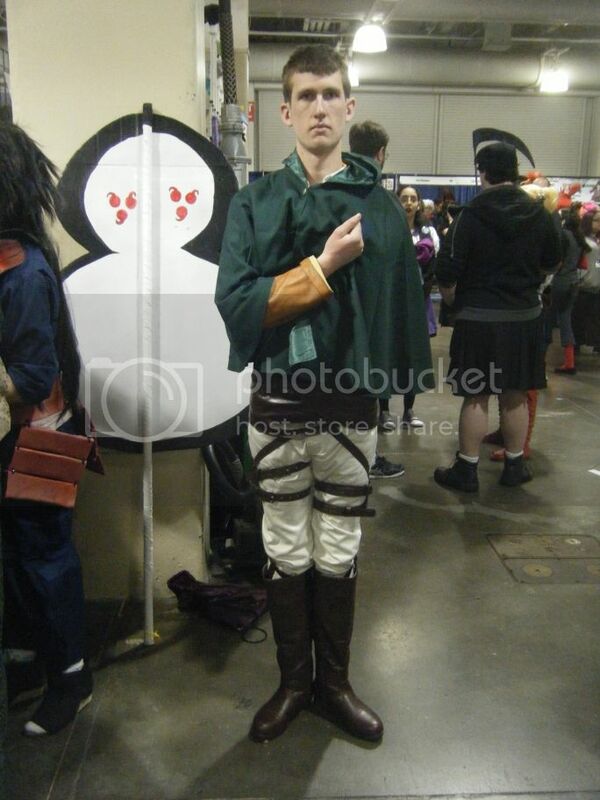 I am SO sorry for not meeting you out where I said I was at the appointed time for the Attack on Titan photoshoot. I lost a bit of track of time I admit, but I also had a phone emergency where my phone went out of juice WAY too quick and I had to walk over 1 1/2 miles to get back to it to get my phone charged, send an important message to people I had no idea where they were at, and THEN try to take care of other business after walking 1 1/2 miles back to the convention. I also was hoping to give you my card so that we could get in touch too. I hope you're not mad at me bro, you were really cool beans to talk to and I felt absolutely horrible about that. I was the Ellis from Left 4 Dead 2 with the Guitar Hero guitar. Please send me a PM if you read this, buddy. Last edited by Rick on Thu Apr 09, 2015 11:06 am, edited 1 time in total. I'm looking for the Kanji/Ken I met on Saturday whose badge name was like nashi something something number. He had an orange zip up jacket that had cut off sleeves and I'm really sorry to describe you this way but he was dark skinned. He also had a yellow mop handle and kept pointing his evoker at the ceiling during the Persona shoot that night. I'm also looking for a photographer that took me and my sister's pictures on Friday OR Saturday afternoon. He gave me a business card and it had text only on one side, but it was fairly plain? He was Asian. We were wearing red and orange/yellow cosplays and had our dance fans that time. I'm just curious if the guy that was George Micheal from Wham playing "Careless Whisper" on Alto Sax through the halls on Friday is here on the forums. Reply if that's you. I really wish you had jumped in with us! We were basically picking up party members along the way, and Hiro would have been more than welcome! I'm looking for a Decim (Death Parade), who was leaving the karaoke room when I arrived in the early afternoon on Saturday. He was carrying a little silver tray with a blue martini on it. I didn't get to see his badge, but he was the best Decim I saw and I'm still a little upset that I didn't think to ask him for a picture. Looking for my Kill la Kill zombie buddies from the deathmatch. (I was the Pegasus/first death). You two were cool to chill with. Also looking for the young woman me and my gf (phoenix wright & pinkie pie) met in line for Cosplay Chess. I believe you said you were the Ryoga in Deathmatch. GoggleBoy wrote: Looking for my Kill la Kill zombie buddies from the deathmatch. (I was the Pegasus/first death). You two were cool to chill with. Also looking for the young woman me and my gf (phoenix wright & pinkie pie) met in line for Cosplay Chess. I believe you said you were the Ryoga in Deathmatch. I'm looking for any of the Payday and Hotline Miami cosplayers. Say hi!!! Also I don't think my phone saved the picture of the business card of the woman selling Luvdisc plushes. Who sold those? I would have bought but I had no room for anything of that size. Who did the Holo (The Wise Wolf) cosplay? I've been trying to find who did the Holo cosplay at AB 2015 but I cannot, wanted to know if she had a FB page or something. If you know who I'm talking about and know if she has a page please lemme know! Much appreciated! I am looking for any pictures of Annie from League of Legends cosplay for our handler. She was so amazing keeping us safe and our costumes in shape. However, we did not see any Annie's and would loved to find her some pics of that sinister little sweetie. I'm looking for the Phantom Blood Dio from the Jojo photoshoots (aka Mama Dio). You are fully worth making an Instagram for, I'll absolutely follow you. I'm looking for the Lady Ciel Phantomhive that I ended up dancing with at the Formal Dance lessons on Friday. I was Ymir and I just wanted to say that I had a wonderful time Leading you in a Ballroom Dance M'lady. I hope we keep practicing and maybe We'll get the chance to dance again! I'm looking for one of my fellow Tech staffers who also cosplayed as Seras Victoria. I'm sorry if I bothered you too much on Sunday. I was saddened to see you upset. I just wanted to know what was the source of the pain and let you know that I was willing to lend an ear and whatever else you may have needed. I should have taken the hint and given you both more time and more space to process the events of this weekend. I hope I didn't worsen things for you. "Time is the one thing you don't have. Maybe you should reconsider your priorities?" Cerebral_Boar wrote: I'm looking for one of my fellow Tech staffers who also cosplayed as Seras Victoria. I'm sorry if I bothered you too much on Sunday. I was saddened to see you upset. I just wanted to know what was the source of the pain and let you know that I was willing to lend an ear and whatever else you may have needed. I should have taken the hint and given you both more time and more space to process the events of this weekend. I hope I didn't worsen things for you. Cosplays for 2019: Isabelle from Animal Crossing, Sakura from Card Captor Sakura, Toadette from Mario and ??? from ??? It's alright; we all have bad days occasionally. Salutations! I am the formal Red cosplayer with the dapper pikachu. It was sad that despite receiving your number so as to meet up later or to maintain a cordial correspondence, it seems that the number was input incorrectly and I never quite crossed paths with you for the rest of the convention somehow. If I remember correctly you said you were to be cosplaying Itachi later. Feel free to send a message! I am looking for an amazing Nishinoya cosplayer I saw at the very last second of AB! It was a guy who had the exact same hair as the character. The Wasabi that gave me the easter egg was awsome! And to the other Wasabi in normal clothing, i felt bad after word when i pointed to you, and I said, "you get in the picture too!" also looking for the dealer in the artiest alli who delt me the line: "Fuzzy Patatoes are delicious" as he petted the fuzzy patatoe that also made my Saturday i giggled to no end. We really needed a Hiro for our group but don't sweat it if you got a bit nervous (I too suffer from social anxiety). We are all planning to go to CT con this summer and you should totally hang with us. Old_School_Anime_Lover02 wrote: The Wasabi that gave me the easter egg was awsome! And to the other Wasabi in normal clothing, i felt bad after word when i pointed to you, and I said, "you get in the picture too!" I am looking for the Quiet and Sniper Wolf who were at the Metal Gear Solid Photoshoot on Friday. I was the MGS4 Otacon running the event. It was wonderful to meet you two and you both were just the best! I have another staffer I'm looking for. Her name is Jacqueline and if I remember correctly she was on the security team. I met her during the Dead Dog Party when she put a pair of cat ears on my head and took a photo of me. (Both fine by me). She took photos of many people wearing the ears. I look like I swallowed a rock in the photo, but that was only because the light on her phone was quite bright. I'm looking for some Attack on Titan cosplayers that I met when I was Armin on Sunday! You guys were really nice! Re: Who did the Holo (The Wise Wolf) cosplay? Hello, there is a whole sub-forum for finding people, including specific cosplayers, over here: 2015 Memories Forum. You're more likely to find the person if you search there. I believe this is the Faith cosplay I am referring to in my previous post. I stumbled across it as I was looking at pictures from the con! Anybody know who she is? I'm looking for the Randy Savage cosplayer! I took my first ever cosplay photo with him, and seeing one of my childhood heroes cosplayed at the con really soothed my nerves. I'd really like to find him! I'm looking for the Korra who took a selfie with myself (Asami) and my GF (dressed as Korra also). I think she might have ran a panel too, and gave us hugs. Her cosplay was really good and I wanted to get a photo but didn't get a chance! 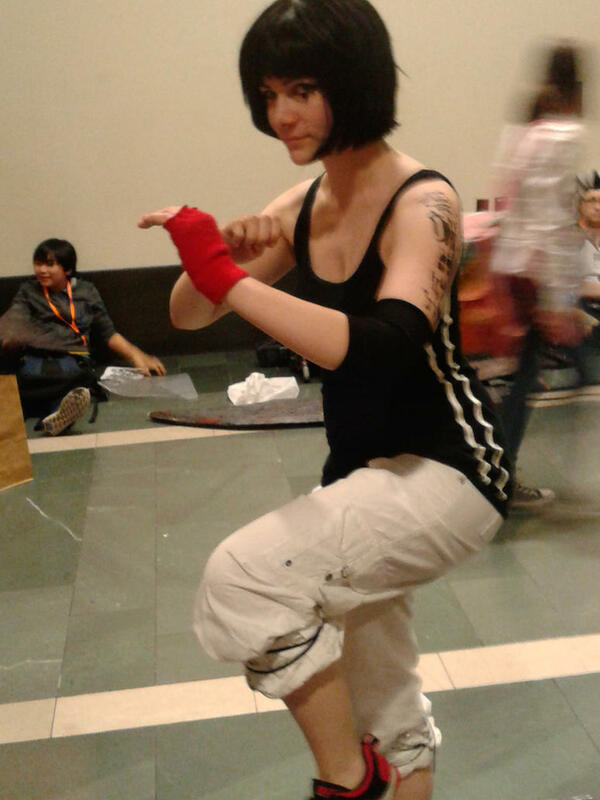 I'm looking for this cosplayer, I don't even know who she is cosplaying! I was sitting next to her backstage at the Masque, and I'd love to get in touch with her!! I am looking for the four Outer Sailor Scouts in this picture https://www.facebook.com/photo.php?fbid ... =960%2C720 . While helping a friend with a music video I noticed them all dancing and quickly asked them if they would be interested in doing a quick Vine. I never stopped to ask for their FBs or whatever so I could properly tag them in the description. I will hold off on uploading the Vine until I get some info cause Vine doesn't allow you to edit the description after uploading as far as I know anyway. tokyograndpa wrote: I'm looking for the Phantom Blood Dio from the Jojo photoshoots (aka Mama Dio). You are fully worth making an Instagram for, I'll absolutely follow you. I'm nearly positive you're referring to one of my close friends, I will try to get her in touch with you! I am looking for the Roy Mustang from FMA, Maka from soul eater and really everyone from Cosplay Death Match! I was the Major Armstrong and thought you all were awesome! It was my first event ever and it was an absolute blast and I really thank the Simon cosplayer from Gurren Lagann and Mako from kill la kill for being really kind and calming my nerves! If you wish to befriend my page is Contradan Cosplay on the book of faces. Contradan wrote: I am looking for the Roy Mustang from FMA, Maka from soul eater and really everyone from Cosplay Death Match! I was the Major Armstrong and thought you all were awesome! It was my first event ever and it was an absolute blast and I really thank the Simon cosplayer from Gurren Lagann and Mako from kill la kill for being really kind and calming my nerves! If you wish to befriend my page is Contradan Cosplay on the book of faces. Hi there! I was the Spinel Sun in the Deathmatch, along with my friend who was cosplaying Ruby Moon. It was also my first time in any of the events, and I have to say you did AMAZING. I was the Ryuko from Death Match who sat in front of you with my friend who was Nui before it began! Oh my God, you were hysterical. Amazing. I was the Kiki in the Death Match! This was my first year as well and it was super fun! You guys had me and my friends laughing like crazy, you were amazing! Yo! I was the Mello Saturday night with a group of DN cosplayers (also around the AA slightly earlier). Burn scars, studded coat, that was meee. Maybe? Unless there were more Mellos on Saturday than I knew of! I do have a tumblr, too! SOME PEOPLE DON'T HAVE FACEBOOK YOU KNOW! but right now i'm thinking of setting one up just for my cosplay pictures. Old_School_Anime_Lover02 wrote: SOME PEOPLE DON'T HAVE FACEBOOK YOU KNOW! Someone who uses Facebook more than I do can correct me if I'm wrong, but I do believe that they can make their album public that anyone can view them even without being logged in to FB. So if you're having trouble accessing the FB album, it's possible the album was not made public. Also, please realize that using all caps in an online forum is considered screaming, so I would ask that you please demonstrate your concerns in more constructive way, e.g. "I'm unable to view your album because I don't have Facebook. Would you be willing to make it public so that I may view them? Thank you!"